Timothy Chow a Ross County footballer in the Scottish top flight, born in Wigan, England might seem like an odd way to start View From The Tofu Bowl but this is exactly the reason why we start here, to bring you football stories from East Asia or about East Asian players and the growing culture around the Asian football scene. As someone who lived in Taiwan over seven years ago and has visited recently, for a nation of over 20 million it has lacked good footballing infrastructure which hasn't looked likely to improve until recently. 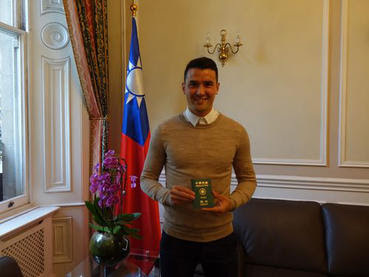 With the recent victories against Bahrain and Singapore leaving Taiwan on the cusp of qualification for the finals of the Asian Cup for the first time since 1968 this has created a buzz around the National Team for the first time in recent history, add in the imminent call-up of Chow and that buzz has intensified. Taiwan has sat in the bottom reaches of the FIFA Rankings sitting in a lowly 191st in June 2016, to their highest ever ranking - 143rd - climbing 48 places. Currently, Taiwan is two games away from a place at their third Asian Cup and first appearance for 51 years. The confidence within the side should help Chow settle into a team on the up with his experience in professional football bringing positive benefits to his teammates. With news, the application was accepted fans are excited to see if Chow will get his first call-up against Turkmenistan. Englishman Gary White, the national team manager is aware of the situation and will be very excited to bring a player in of Chow's talents.